With several experts working on resolving the opioid crisis in Maryland, requesting a food and drug administration ban on the drug doesn’t appear to be one of the proposed solutions. BALTIMORE — With several experts working on resolving the opioid crisis in Maryland, requesting a Food and Drug Administration ban on the drug doesn’t appear to be one of the proposed solutions. 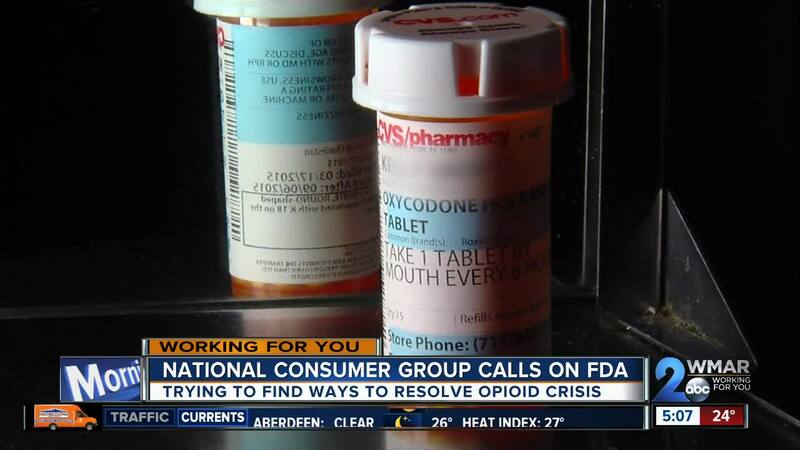 Addiction is a problem throughout the nation and amid a dependence on opioids, the consumer advocacy group Public Citizen is looking towards the FDA for help. “Public Citizen and other advocacy groups, including Physicians for Responsible Opioid Prescribing, several years ago petitioned the FDA to change the labeling for all opioid products to include instructions for maximum duration of use, and maximum dose,” said Dr. Michael Carmone of Public Citizen. Some health and state officials hold pharmaceutical companies responsible for what role they may have played in creating the crisis. They blame drug manufacturers for physicians over-prescribing opioids as well as for misleading doctors on the dangers of opioids from its addictive properties to the possibility of withdrawal. “Having that type of instruction and labeling would prevent the pharmaceutical companies who make these products from promoting them for chronic pain and other uses that they’ve not been shown to be effective. Unfortunately, the FDA denied that petition. That is one action that could play a key role in helping to rein in this problem,” said Dr. Carmone. Meanwhile, the Food and Drug Administration recently approved another opioid for patients called Sufentanil. It’s a drug 500 times more potent than Morphine, or up to ten times more powerful than fentanyl, the drug the musician Prince died of an accidental overdose in 2016. The Maryland Department of Health cites large increases in fentanyl-related deaths for the overall rise in opioid-related deaths in our state. Concerns about Sufentanil led the consumer advocacy group public citizen to make another request to the FDA and asked it to ban the drug. “The decision by the FDA to approve Sufentanil under the brand name Dsuvia, a reckless decision from a public health perspective. That drug never should have been approved, because it’s only going to endanger, it’s going to only exacerbate, the opioid crisis,” said Dr. Carmone. WMAR-2 News reach out to FDA officials about finding solutions to the opioid crisis. They declined the interview.